Google Analytics is the best available analytics tool for webmasters, but it’s not always practical or available. It has some issues. It’s fairly common for spammers to inject false referrals, which throw off your metrics. The sampling occasionally means your data is less accurate than it could be. It has issues with historical data, and it buries some valuable data behind reports you need to make and generate yourself. In short; it’s not exactly user-friendly if you don’t want to invest some serious time into it. There are an absolute ton of alternative analytics suites out there, both for stand-alone suits and analytics built into, well, everything. It’s practically impossible these days to find a web app or CMS that doesn’t have a pile of analytics options tacked on to the end of it. Of course, the best analytics aren’t free, and the free analytics aren’t always all that good. That’s why I’ve put together a list of decent free analytics you can use instead of Google Analytics. 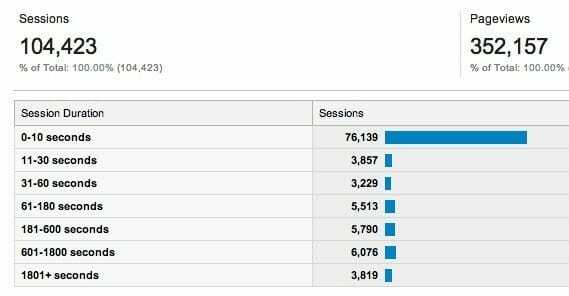 The number one issue Google Analytics has is measuring true session time. Google only triggers on page load or specific actions. If I click to a blog post and start reading, spend 20 minutes reading a lengthy post, then close out the tab satisfied, there’s no second action. As far as Google sees, I landed and disappeared. There’s no way to tell between a 20 minute visit and a 1 second visit. This throws off all data about bounce rates and time spend on site, which both tend to be used extensively by marketers. You can get around this issue, sort of, using a bit of a hack promoted by ImImpact. Essentially, what this code does is forces Google to refresh a bit of its script. It pushes an event that tells Google that the visitor is still there, so it can differentiate between a bounce and a user hanging around. It doesn’t work every 30 seconds, just once, so all it really does is filter out bounces. It won’t accurately measure single-page visits. For that, you need some other real-time analytics. Analytics is also quite complex, which means it’s difficult for a newbie to wrap their head around. It can be very daunting and it makes it difficult to explore and set up custom reports to show you what you really want to know. 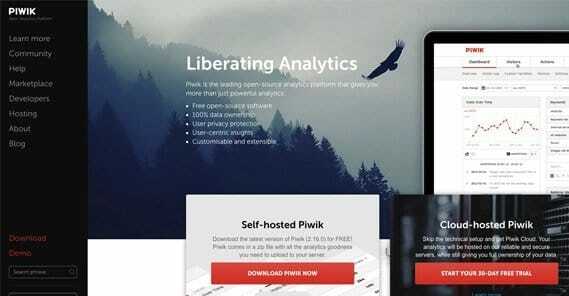 Piwik is a unique sort of analytics. It’s built with privacy in mind, but it’s not a hosted solution. See, Google Analytics just requires that you verify your site and install a bit of code. Piwik is self-hosted, which means you need to have the actual analytics engine running on a server somewhere, specifically in an account you own. You don’t have to worry about a third party company accessing or controlling your data, but you do have to worry about keeping your data accessible and secure. If you prefer the more traditional analytics method with the hosted distribution, you can pay for that, but the self-hosted version is free. It’s also open-source, if you want to dig into the code and see what’s going on. One great benefit is the ability to import log files. This gives you access to historical data from before you implemented Piwik, as well as data saved in logs from other sites if you want. If you want mobile analytics as well, Piwik does it for Android and Apple devices. Sorry, Windows phones. As an open-source platform, it’s possible there are extensions, themes, and reports you can download and integrate with your own installation. You can use it stock, of course, though the interface is a little cluttered and a little difficult to get used to. Perhaps the biggest downside, though, is how poorly it integrates with AdSense and AdWords. Nothing besides Google Analytics has a good time with those systems, though, so this will be a common complaint. In fact, assume none of the items on this list work very well with Google’s ads unless I explicitly say they work well. The hardest part of Piwik is that you have to manage and maintain it yourself. If something breaks, it’s on you to fix it. If the software needs updating, you need to update it. If the server goes down, you lose the ability to record or analyze data. It’s not really a beginner’s solution. Clicky is one I was hesitant to include on this list, but did so anyways. The analytics it provides are actually quite good, but they’re also a little limited in nature. 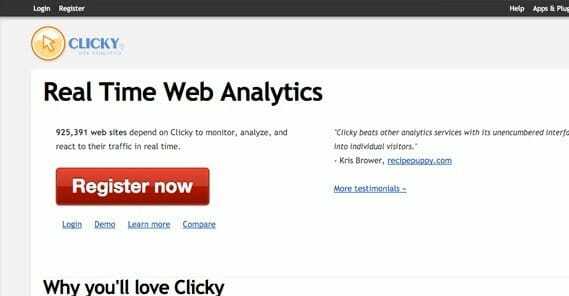 I consider Clicky to be a good piece of analytics software that works as a gateway to more advanced features. Essentially, because Clicky is so limited, it’s not very complicated. For example, it can connect to YouTube to get some basic video analytics, but those analytics don’t really offer anything that YouTube itself doesn’t. It has keyword tracking, but limited on-site tracking of visitors and sessions. A lot of its best features are, of course, hidden behind the paywall by being part of the Pro version. While this all sounds like a detriment, it can be looked at as a blessing; those features it does have are all simple and presented front and center. You can learn them all and figure out most of their intricacies in a matter of minutes. The base free version allows you to track one website with up to 3,000 daily views. It gives you content analytics, search data, referrer data, basic segmentation, mobile analytics for both Apple and Android devices, and some other features. If you want their real-time analytics, download tracking, data exporting, split testing, or any of the dozen other pro features, you need to pay. The cheapest version is $10 per month and allows you up to 10 websites with 30,000 daily views. If you want heatmaps and uptime monitoring, you need to pay even more, a monthly minimum of $15. 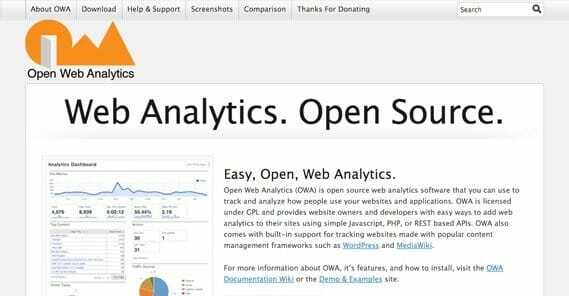 OWA is one of the premier open-source analytics suites out there. It’s unique in that it works for both websites and apps; usually you need a separate analytics suite to work with apps. They even have a WordPress plugin, so integration with blogs is a cinch. Like Piwik, OWA requires you to install it yourself and maintain it on a server with relevant uptime. It’s generally fine installing it on the same server as your website; if your site is down your analytics aren’t recording anything anyways, so if the analytics code is down too, it doesn’t matter. Besides, you should be using a web host with 99.99% uptime as it is. You aren’t limited in any way beyond what your sever can handle. You can use OWA with any number of websites regardless of their traffic. You have DOM click tracking, heatmaps for clicks and mouse movement tracking. All of this is generally not available with Google Analytics, and requires you to use a third party application anyways. Also, I know this is a little subjective, but I quite like the way OWA lays out their dashboard and their tables. It’s graphical, it’s well-designed, and it’s not really cluttered. You can, of course, customize reports as much as you would like. This particular bit of analytics code is billed as something to help you directly increase your performance via marketing and information. In addition to their analytics code, they also have an SEO optimizer, a site analyzer, and more. My primary gripe with this suite is how basic most of the tools are. You get your trend analysis, you get your keyword referrals, you get your heat maps, you get your recent visitor tracking, you get your inbound link tracking, you get your SEO analyzier, but it’s all stuff that’s done better by other analytics suites. I suppose you get what you pay for though; a free tool is a free tool. 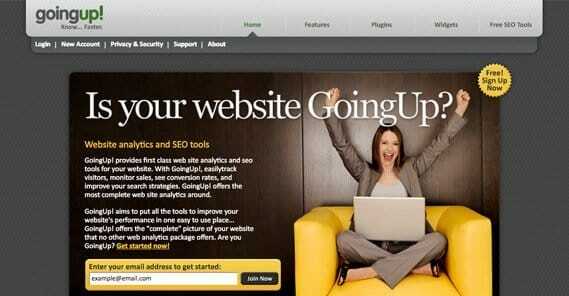 GoingUp also tracks rankings for you, including PageRank and Alexa Rank. Of course, if you’ve been reading this blog for any length of time, you probably know that both of those are fairly useless metrics to the modern marketer. PageRank hasn’t been updated in two years, and Alexa is just a bland comparative ranking amongst a subset audience. I tend to think of GoingUp as a supplemental tool. Look at what they offer, then pick a different analytics suite. If that other suite is missing tools that GoingUp offers, use them as a supplement. Just make sure the tracking code doesn’t slow down your site or conflict with your other analytics. Inspectlet bills itself as a supplement to Google Analytics. As they say, GA tells you what is happening on your site. Inspectlet tells you why people are doing what they’re doing. Essentially what Inspectlet does is records visitor sessions, including every action they’re taking with the mouse. They don’t keylog, which is good – another similar app does log keystrokes, and has gotten itself listed on filter lists for adblockers as a consequence. 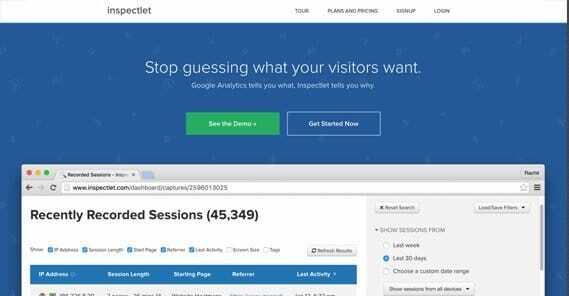 By tracking mouse position and movement, as well as click times and locations, Inspectlet can take a live version of your site and apply that data to create a “video” of the visitor session. 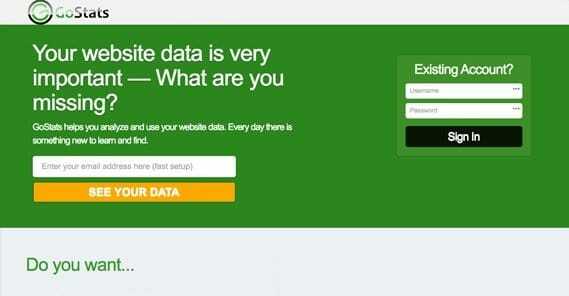 You’ll be able to see how the visitor is interacting with your site as if you were looking over their shoulder. As such, this really is a supplemental tool. Use it like the free version of Crazy Egg it is, in addition to something like Google Analytics, Raven Tools, or OWA. It doesn’t have enough features to stand on its own, but it’s not something to discount entirely. Possibly the best feature is the conversion funnel tracking. You can set up an ideal series of pages – landing page, purchase page, etc – and track what the user does on each. You can then see exactly what stops them, be it a specific form field, a bit of text, or not seeing a button. This is another pretty basic version of analytics. It’s easy enough to create an account, paste in your analytics code, and read reports. What’s contained in those reports? Unfortunately, it’s all very minimal. You have minimum and maximum usage data, visitor traffic stats, a visitor counter, and some minor data about individual visitors. Specifically, you see their geographic location and IP address, their ISP, client, and browser, and the path they took to reach your site. GoStats has been around for 17 years, which makes it odd that they’re as minimal as they are. I suppose they found a business model that requires virtually no support, they can offer their product for free, and they don’t need to care about keeping up with the times. As long as their stat counters work, that’s good enough for them. The gimmick here is that GoStats creates a public counter for your information for you to display on your site. It works fine, but it allows users to click it and see more detailed information about your stats – essentially giving anyone access to what basic analytics it provides. If you want to hide this information, well, that’s where they charge you. If all you want is a traffic counter and some minimal stats, this is just fine. If you’re looking for actual business-tier actionable analytics, you’ll want something quite a bit more robust. 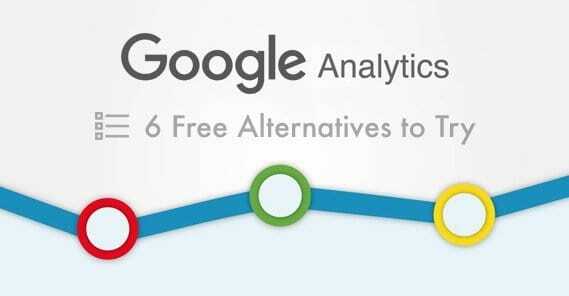 When all is said and done, Google Analytics still reigns as the best available analytics suite for free, which is unfortunate but unlikely to change. Anything on par with GA is going to have to charge simply to support their infrastructure and development. There are many reasonable paid options, but that’s outside the scope of this post. Use what is comfortable for you to use, as long as you can make good use of it. Just don’t be surprised if people suggest Google Analytics to you when they find out you’re using a mishmash of limited free tools. It’s complex, yes. It has issues, yes. It’s still about the best you’re going to get for free. Hi Kenny Great insights , many thanks. I would be willing to add another company (Countly) who is doing both web and mobile analytics on the same platform. Possible to add Countly Web Analytics in your comparison next time? Thanks!